Not to be confused with World 5-8. 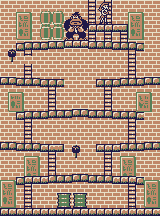 Stage 5-8 is the eighth level in the Desert in the Game Boy version of Donkey Kong. This stage is a boss fight with the original Donkey Kong. Mario starts at the bottom. This stage is a reconditioned version of 25m, the very first stage of the arcade Donkey Kong. It is divided in two layers, each of three stone platforms: two are on the sides of the level, while the third is longer and occupies the central column of the stage beneath the other two. In this division, the sandstone floor at the base and the top platform on which Donkey Kong stands are not counted. All the platforms, including Donkey Kong's, are bent down and connected by ladders. These two factors facilitate the rolling of the barrels hurled by Donkey Kong. Two Oil Drums are found on the base floor right under the first central platform; when they get hit by barrels, they spawn Fires. Mario must make his way up while avoiding barrels and Fires to reach Pauline to end the level with Donkey Kong taking her away again. Donkey Kong runs and encounters two Miiras; he watches as the Miiras go towards Mario. As the Miiras get close, Mario picks up the first one and throws it at the second one, defeating them both. Donkey Kong, shocked by this, continues to run with Pauline as Mario continues to chase Donkey Kong. The cutscene then ends and the player is given lives based on their score. This page was last edited on January 19, 2018, at 07:15.